Power is a strange desire, in which adequate is seldom enough, writes Iain Robertson, a factor that entices the German carmakers into producing surfeit models, where the available punch is enough to scare users; BMW is not alone in its endeavours. While I have been ‘encouraged’ to accept not just a maddening aim of ALL carmakers to enter the SUV scene but also a more pressing issue related to oodles of extra power, thanks to ‘force majeure’, my capacity to comprehend precisely ‘why’ (in both instances) has spiralled into the realms of ‘do I care anymore?’. Despite an environment that is becoming increasingly reliant on ‘green-tech’, backed-up by a discernibly small level of interest in hybrids and EVs (still less than 1% uptake rate in the UK), I keep seeking the disconnect. At which point does the consumer start to appreciate that our dwindling stocks of natural resources are being diminished further by carmakers insisting that we, the consumers, seem to want more power, more speed and brisker acceleration, let alone heftier fuel consumption? Is it us? Or, is it carmakers in a tailspin? Personally, I am veering increasingly towards the latter thought process. As stated earlier, BMW is not alone in this failing endeavour. Both Merc and Audi, while producing fuel-sipping options alongside, insist on big banger outputs and track-focussed chassis settings. Here is a question for you…when was the last time that you ventured onto a racing circuit, in your stilted SUV, in the hopes of giving Messrs Hamilton, Vettel and Raikkonen a run for their money? 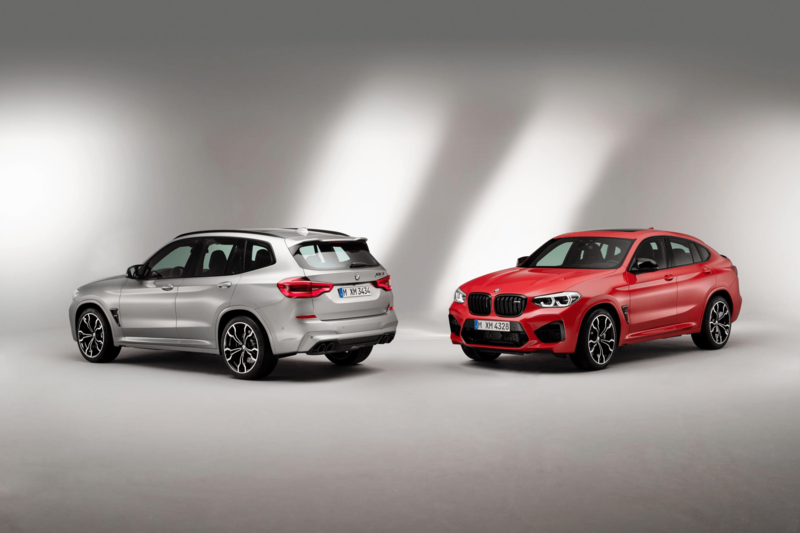 Anyway, for the first time, BMW M (the German firm’s Motorsport division) is expanding its high-performance line-up to include the X3 M and X4 M Competition models and both will herald the arrival of a newly-developed six-cylinder engine where advanced 3D printing has been utilised in its production. 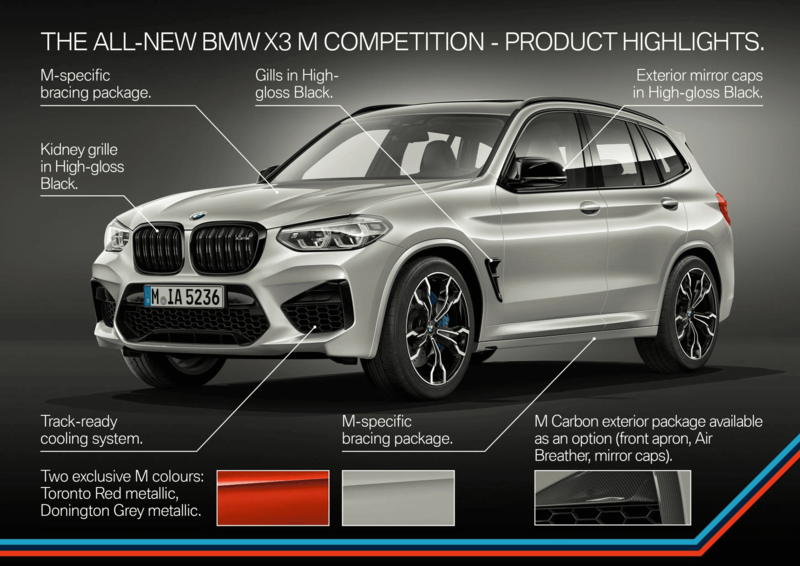 The X3 M Competition, BMW’s midsize SUV, and the X4 M Competition, a coupe-bodied alternative based on exactly the same platform, are powered by the high-revving engine that features track-proven cooling and oil supply systems, as well as the latest M TwinPower Turbo technology. Generating an astonishing 510bhp, the 3.0-litre in-line petrol engine has a peak torque of 442lbs ft, while a dual-branch exhaust system provides the aural delights (pops, bangs and farts). The ongoing development of M TwinPower Turbo technology, coupled with the inclusion of two particulate filters and four catalytic converters (to keep the ‘greenies’ happy), ensures that the high-performance, lightweight unit can claim remarkable efficiency and exceptionally low emissions for an engine of its capacity. BMW’s long-standing efficiency remit means that its official combined fuel consumption is around 26.9mpg, with CO2 emissions of 239g/km, both of which figures ensure that only the truly deep-pocketed need apply. The use of cutting-edge technology is at BMW’s heart and the cylinder head has a core manufactured using 3D printing. Interestingly, this additional manufacturing process enables geometric forms to be created that are beyond the capability of conventional metal casting techniques. 3D printing technology has also cut the weight of the new engine’s cylinder head core and allowed its coolant ducts to be routed in a way that optimises temperature management, which is a significant pay-off that is sure to be adopted by other carmakers in the future. The six-pot unit serves up its maximum punch between 2,600 and 5,950rpm, with another 300rpm in reserve, before reaching the redline at a howling 7,300rpm. Both models despatch the 0-60mph benchmark in a mere and repeatable 3.8s, although their top speeds are electronically governed to 155mph. If the optional M Driver’s Package is specified (which will be available from August 2019 at a price yet to be introduced), top speed rises to a notional 174mph (although the car might actually touch 200mph without the governer) and the customer receives the chance to participate in an M Intensive Training in the UK, by which to hone their driving skills. How many will, or should, take-up this option remains to be confirmed but knowing the average monied sports vehicle driver as I do, the uptake rate is sure to be low, after all, why would BMW cut off its commercial nose to spite its face, by insisting that ALL Performance Pack drivers indulge in the extra education? Naturally, there is a hefty (pre-dealer discount/allowance) price to pay, with the X3 M Competition tagged at £77,070 and the X4 coupe alternative weighing in at £2,920 more. All of that power is channelled through an 8-speed automatic transmission, with paddle-shifters and there are three shift-speed modes, from smooth to joltingly quick. Naturally, 4WD is standard, which helps with both traction and stability, although the M Dynamic chassis setting will create a more track-focussed power split. With access to such an enormous swathe of power and torque, it is inevitable that the Laws of Physics will hove into view, to provide ample proof that excess can also equate to a loss of control. Crammed with BMW technology, the usual plethora of lane discipline, blind-spot awareness and adaptive cruise control will do their level best to keep most aspects on the straight and narrow. However, with access to such an enormous amount of potency, the capabilities of these new models will vary from sporty shopping car to cruise missile potential. Take care out there! Conclusion: Not one but two ‘Competition’ designated derivatives of BMW’s important midfielder give added choice to potential acquirers. Yet, you cannot help but ask, when will this search for ever more power cease? We guess, when buyers stop requesting it…or carmakers wake up and smell the coffee!